Gosh, I haven't posted since before Christmas. I got through Christmas. I put on a good Christmas for Gordon. Maybe a great Christmas. But I also got a nasty cold and came out of the holidays in a funk. As you've seen here on the blog, I was full of HEY, LIFE! and WOW, OPPORTUNITY! and BLANK CANVAS! sentiments for months. But then I just fell flat and seemed to lose interest in everything. Social life, self-care, home improvement, good food, personal finance, hobbies. It just all went plop and I didn't really dig doing anything any more. Thank goodness for friends and family asking me to come out and do stuff. Now, I'm not one to shirk responsibilities when others depend on me, so I'm lucky that others depend on me. Business has been picking up at work, so that's good. And Gordon is my inspiration to keep things interesting. We got out and about to some fun stuff, including an overnight road trip to Hamilton to see Paw Patrol Live. Something weird happened at that show. The performance began, and soon they got to the big theme song, with all the pups on stage singing the Paw Patrol song. And I found I was crying. WTF? Crying because it was beautiful that I was in a theatre beside my little boy, blowing his mind with a live stage show? Crying because his mommy should've been there too? Crying because I had sadness bottled up and pushed down? Crying because I was so bloody tired? I don't know. It was weird. I also went to Toronto to see comedian Louis CK with Michael Hainsworth. What an amazing performer. He's just so good. And, some crappy stuff happened. One day at work, a colleague was so funny that I doubled over laughing and slammed my head into the sharp corner of a desk. Same day, Gordon got bonked in the head by a careless preschooler with a shovel. 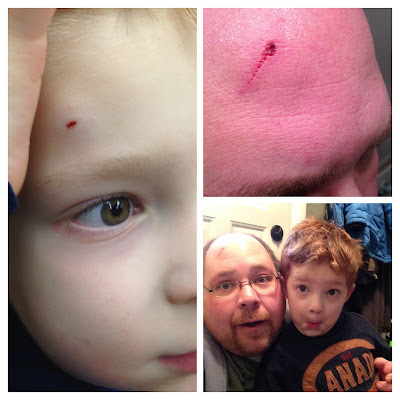 Another day, coming back from an outing with G to the London Children's Museum, I crashed our car. Not a big collision, but it disabled the front left wheel. Repairs would cost more than the car was worth, so I donated it to a local charity. Our other vehicle also needs more work than it's worth, so we'll be car shopping. I've had other ups and downs. Some more bloody injuries -- slicing a piece of my thumb off while unboxing a Christmas present for G, gashing my shin open on some glass in the basement. Wins include attending a Big Wreck concert with a friend, after having seen the band several times with Amanda. She would've loved it -- singer Ian Thornley's voice was the best I've ever heard. And I build a brand-new PC for video editing. This past weekend, I took G to Super Hero Day at a local mall and showed him that even if what you love is dressing up as Spider-Bat-Man, there's a whole bunch of people out there who also like what you like. Life lessons. Still, it feels like I'm treading water. Time continues to pass since Amanda died. I think it was last month that the 12th came and went without me realizing it was the month-anniversary. There will be more moments like that where I straddle the line between "this just happened" and "this happened some time ago." Big things are on the horizon, I know. I've been registering G for junior kindergarten. We need a new roof on the house. A kitchen reno is possible. The yard will need to be cleaned up for spring so Amanda's garden can flourish again. And yeah, I need to buy a car. I'm back to getting the house tidied up, bit by bit by bit. As much as I put away, gave away, threw away after Amanda died, bits and pieces of our old life are still everywhere, just everywhere. Her electric toothbrush finally went into a drawer this week. But the drawer still has her hair ties and makeup brushes. I'm finding food in the pantry that I know I'll never use. Spelt flour? Nah, not gonna happen. There's a bottle of water in the fridge from her time in the hospital one year ago. Still has the imprint of her hospital card on it. G has been good but recently opened up about the night Amanda died. He said he knew she was dying when he heard me calling out to her and she wouldn't answer. Then he heard me call 9-1-1 and the police/fire/ambulance arrived. He said he felt sad. Until a few nights ago, we'd never talked about that. He's confessed to having a hard time remembering mommy. He said he can remember her smile but not much else. I can't have that. So I made him a hardcover book on Shutterfly full of colour photos of the two of them together through the years. I talk to him about things they used to do together. Special things they shared. He will know that she loved him more than anything else in the whole wide world. I won't let him forget. Tired boy after chocolaty dessert. So, no great realizations, epiphanies or breakthroughs. Just clomp-clomp-clomping forward into the unknown, trying to pepper the greyness with moments of colour.